Nutrition and cognitive stimulation in tandem! Nutriset is introducing simple and eco-friendly solutions to strengthen the efficacy of its nutritional products whilst stimulating the cognitive development of children. Play is essential to social, emotional, physical and brain development of children. Adequate nutrition, care and attention for safety, and stimulation are necessary for a child to grow up healthy. The brain development of a child is phenomenal: it can create up to 1,000 neural connections per second in the first few years of life. Play is a crucial phase in the treatment of malnutrition. Emotional and physical stimulation through play can significantly reduce the risk of mental retardation and irreversible emotional disorders caused by severe acute malnutrition. Studies have shown that children who take part in stimulating activities at the same time as receiving nutritional complementary food obtain better results than those who only receive nutritional complements. 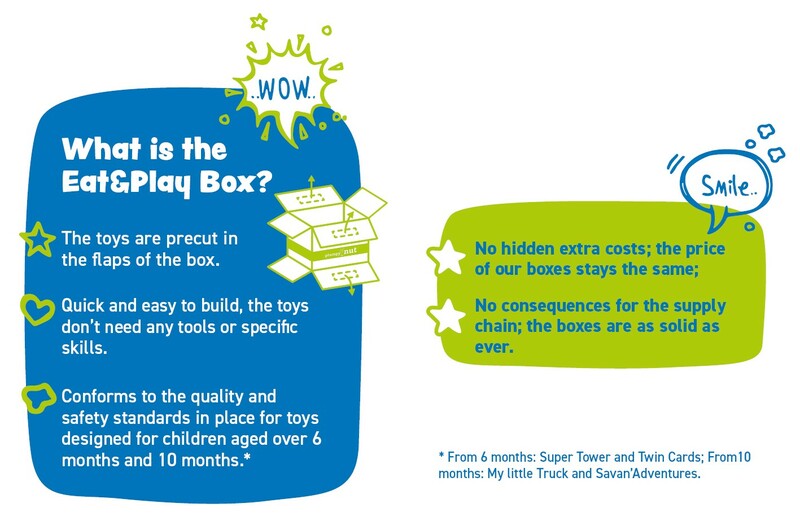 The Eat & Play Box turns into toys for children aged 10 months and over. Now available for Plumpy'Nut® and Plumpy'Sup™ packaging. Playing with My little Truck stimulates language, develops imagination and motor skills (from 12 months). Playing Twin Cards with the child develops his sense of observation, concentration and memory (from 18 months). With Savan'Adventures, contribute to stimulate the language, develop the imagination and the motricity of the child (from 12 months). Super Tower is an ideal game to promote eye-hand coordination (from 10 months). WARNING! Respect basic safety rules. Don’t give dirty or damaged toys to children. Never leave a child alone with the toy.